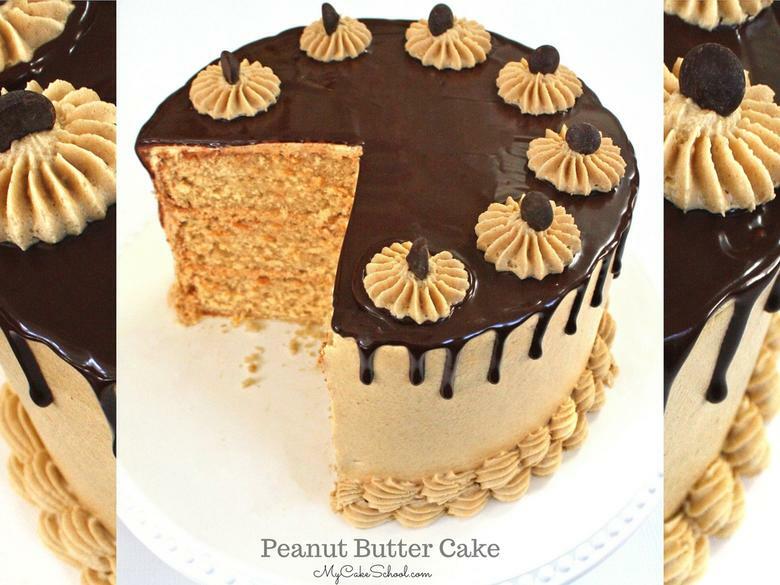 This Peanut Butter Buttercream Recipe is one of my all-time FAVORITE frosting recipes. It makes the most wonderful filling and frosting for chocolate cakes and cupcakes. You will love the peanut buttery flavor, the light and fluffy consistency, and how easily it pipes! Not only does this peanut butter frosting taste fantastic, but the recipe is incredibly easy to throw together. Really, you’re just minutes away from this deliciousness!! Okay, let’s get back to the star of our post. There are countless reasons to love this recipe. This peanut butter frosting is perfectly peanut buttery, has a delightfully silky texture, and if you are a fan of the Viva Paper Towel Method of smoothing, it smooths exceptionally well. There’s no better match for peanut butter frosting than a delicious chocolate cake, is there? You have the sweet and salty flavors from the peanut butter buttercream, and the rich decadence of the chocolate cake. Perfection! I absolutely love peanut butter buttercream swirled high onto cupcakes, sandwiched in between layers of rich chocolate cake, or injected into the centers of chocolate cupcakes to make them even more irresistible. You can frost entire cakes with this recipe also, as we did in our AMAZING Peanut Butter Cake Recipe! When I make cupcakes, I often fill the centers with a filling–sometime’s it’s the same as the swirled frosting on top, and other times I go with a different flavor. I love this peanut butter buttercream frosting so much that I try to incorporate as much as possible– YUM! To inject this buttercream frosting into the cupcakes as a filling, simply load a disposable piping bag with peanut butter frosting, snip away the tip, and insert right into the center of the unfrosted cupcake (about halfway down). For a little variation (especially when using this as a filling for a chocolate layer cake) I love to stir in mini chocolate chips! Keep in mind that mini chips won’t fit through small or closed star piping tips! But this makes a great filling for a chocolate layer cake. I will warn you that this frosting is HIGHLY addictive…and you may have to hide the bowl immediately after mixing up a batch. The peanut butter frosting is a lighter consistency than straight peanut butter, so you can easily get carried away with sampling. Haha! I know that I always do. Make it once and it’ll be your go-to peanut butter buttercream frosting for life! YUM. Step away from the All Natural Peanut Butter! *One important thing to remember when choosing your Peanut Butter for this recipe is that “natural” peanut butter doesn’t work as well. At least, the ones that we’ve experimented with over the years haven’t worked as well. You can still use it if you must, the taste is still good, but the consistency isn’t nearly as smooth. Peanut Butter Buttercream with Chocolate Cake is the BEST! Here are our favorite Chocolate Cake & Cupcake Recipes! Looking for the BEST chocolate cake or cupcake recipe? Make sure to save these tried and true favorites! We love our Scratch Classic Chocolate Cake recipe (we make it most often! ), our Scratch Chocolate Cupcake recipe, Homemade Devil’s Food Cake Recipe , our Scratch Chocolate Sour Cream Cake, as well as our doctored cake mix recipes for Chocolate Sour Cream Cake and Chocolate (Doctored) Cake. So many choices for chocolate cake! In the bowl of your mixer, add the butter and mix on medium until butter is soft and smooth. Next, add the peanut butter and mix! Next, add the powdered sugar a little at a time, alternating with the milk. Add the vanilla, and mix for 4-5 minutes until nice and smooth! That’s it! It doesn’t get much simpler, but trust me, this recipe is the BEST! 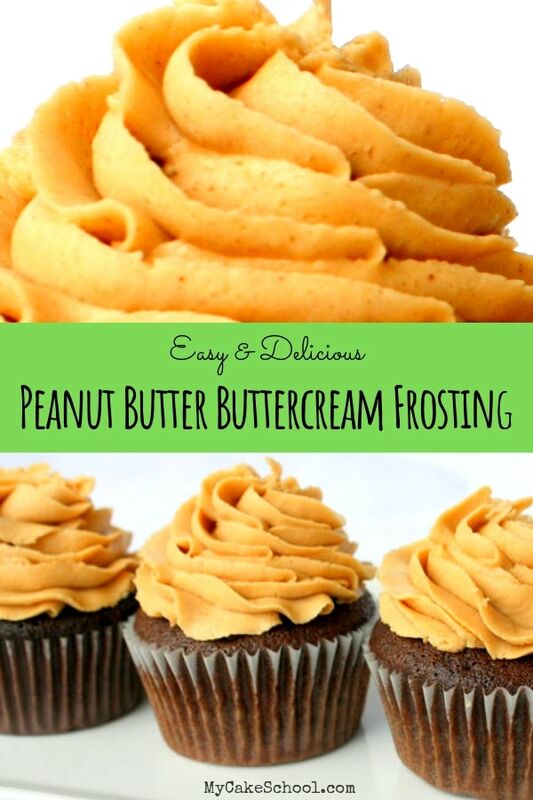 This amazing peanut butter buttercream frosting tastes amazing and is SO easy to make! We love it with chocolate cakes and cupcakesQ! 1 cup ( 255 grams) Creamy Peanut Butter Do Not Use Natural or Reduced Fat. We have used Jif and Peter Pan Creamy brands. ***Peanut butter brands labeled "Natural" that I have tried do not work as well with this recipe because the consistency isn't as smooth & creamy. I've used Jif & Peter Pan (Creamy) with good results! 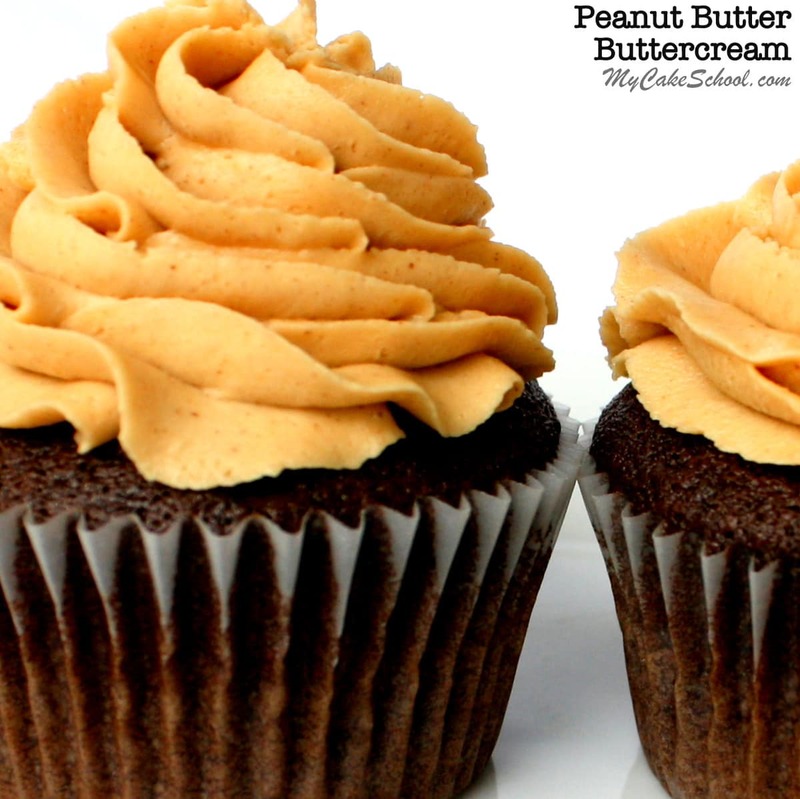 Here is the cake version of our peanut butter cupcakes pictured above! 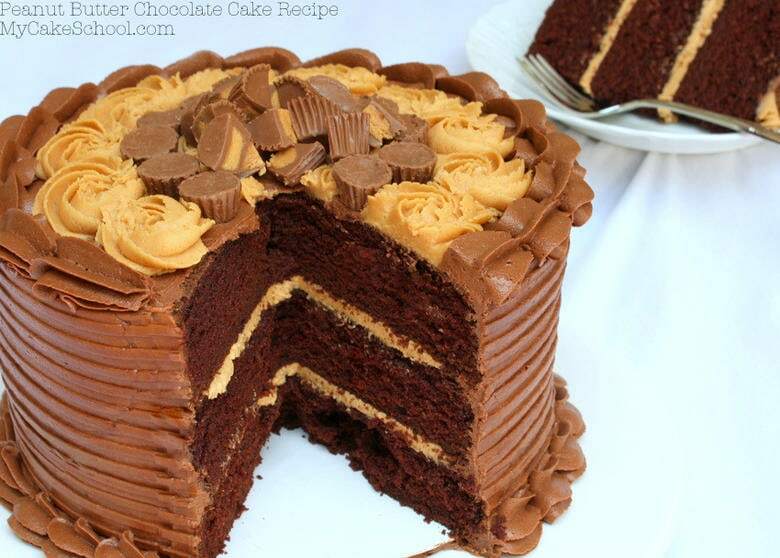 Peanut Butter and Chocolate Cake is ALWAYS a crowd pleaser! Don’t miss our full roundup of our popular cake and frosting recipes in our Recipes Section! Also, if you love simple and creative cake decorating ideas, check out our Free Cake Tutorials Section! Finally, if you are interested in learning even more cake decorating techniques, you should consider becoming a member of My Cake School! Members have full access to our entire collection of cake decorating video tutorials! For more information, check out our Join Page! We’d love to have you! Since this recipe does not contain shortening, should it be refrigerated prior to transportING in a car? Hi Jenny, It is not necessary , but whenever possible it is a good idea to refrigerate this and other cakes that are going to be transported. Will the cake need to be refrigerated using this filling or as frosting for cupcakes? Hi kakelover, You will not need to refrigerate the peanut butter frosting. We think all butter creams are best when eaten by the third day when they are not refrigerated. Great for whoopie pie filling too! OMG! Thanks for answering so quickly Melissa! I asked you a question yesterday as well, and you got right back to me! I have to post my picture of the cake on the site! But yes, I now am going to make cupcakes with this peanut butter buttercream also for the Superbowl! Go Panthers!!!! Again, thanks for getting back so quickly!!!!!! Love you guys!!!!! Hi everyone! I made this frosting as a filling for cupcakes 2 days ago and I have got to tell you…IT IS AWESOME!! EVERYONE loved the cupcakes! THAT frosting is everything! I received phone calls from a few friends yesterday asking if I had extras. So I had a small sugar reunion at my house yesterday!! Thanks Melissa and BeBe!!! You guys rock…all day every day!!!!!! I’ve never made any icing from scratch before but, I saw all of the wonderful comments and thought I have to try this. So I had to, of course, make brownies to try it on first. It is AMAZING!!!! I will be making/using this for all of my chocolate-peanut butter dessert combos. Thank you so much for such an easy, wonderful, absolutely delicious recipe! My family loves it!! I don’t have jif or peterpan here, is it okay to use skippy peanut butter instead? i would live to try this soon!! thanks for sharing! I think you could use Skippy. Do not choose one that says Natural or Reduced Fat. It should have full fat content. Yes! 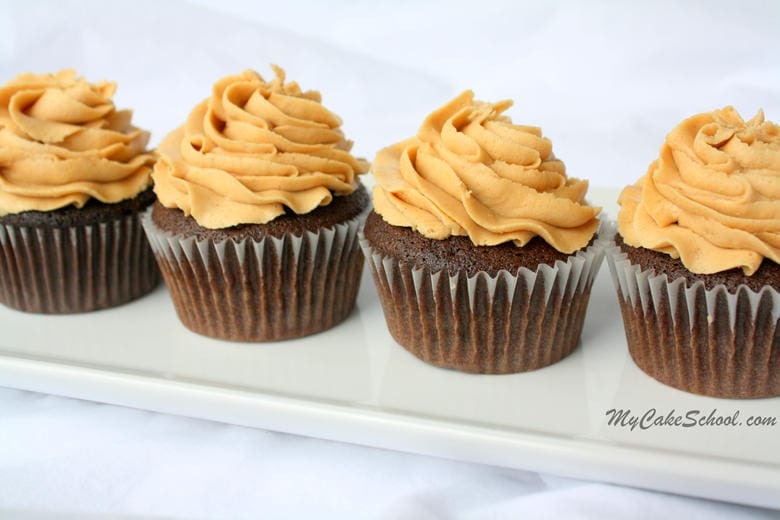 Peanut butter frosting goes really well with chocolate cupcakes n so is orangey frosting. My question is…can i ice the cake with this pb recipe…will it smooth well??? Hi Sandi, I haven’t tried frosting a cake with this frosting for a smooth finish, but I think that it should be fine! You can always additional milk if it is too thick. Just make sure to use creamy peanut butter…the “natural” version doesn’t come together as nicely. This frosting sounds heavenly!! I have excess heavy whipping cream from a chocolate ganache recipe that I need to use up, so I was thinking of substituting it for the milk in this recipe. Do you think this would be ok or would it change the consistency of the frosting so that it would no longer hold a shape when piped? Also, would this be an equal amounts substitution or should I use slightly less/more cream than milk? Thanks! Hi MBM, I think you will still need 3 Tablespoon when using heavy cream. The frosting will not crust quite as much as when using milk, but it should still be fine for piping. Begin with 2 Tablespoons and depending on the consistency you like for piping, you can add a bit more. Make sure you are using the right type of peanut butter. The recipe will not work with reduced fat or natural peanut butter. We have used the brands Jif and Peter Pan creamy. Thank you for getting back to me. Good to know that I can use the heavy cream in lieu of the milk, this way I feel like I’m getting the most out of the ingredients. I will absolutely start with 2 tablespoons and go from there. I had just planned on using the peanut butter that I use for everything else (Peter Pan creamy), so good to know that will work too. Can you use salted instead of unsalted butter? Saw that you used a pinch of salt in your recipe so would this be okay and just skip adding in salt? Hi Jean, Yes, you can use salted butter and skip adding any extra salt.